The shattered remains of dead civilizations lie dormant throughout the Inner Sea. Whether such ruins are entombed under tons of rubble, sunk beneath white-capped oceans, or warped into blasted wastelands by otherworldly energies, the perils of these obliterated empires are equalled only by the unfathomable treasures locked within their crumbling temples, crypts, and citadels. Lost Kingdoms provides a detailed overview of six of Golarion's most famous and mysterious ancient nations, fallen empires that promise intrepid adventurers the opportunity to claim untold riches, explore fantastical realms of antiquity, and unravel mysteries thought long lost to the stands of time. Ancient Osirion, the pharaonic empire whose rulers constructed treasure-laden crypts, pyramids, and temples dedicated to their own honour. Ghol-Gan, where cyclopes raised ziggurats to otherworldly deities, but whose works now serve as half-flooded temple-lairs for alien horrors. The Jistka Imperium, the first true civilization to rise after the apocalypse of Earthfall, famed for its golem-crafting artificers and expansionist magistrates. Lirgen and Yamasa, whose astrological divinations and ancestral spirits led their cultures to prosperity, but failed to warn them of the coming of the great hurricane destined to destroy their lands. Sarkoris, where barbarian warlords and druids now raise spears against the demon-spawning rift in the centre of their ancestral lands. Thassalon, a divided empire ruled by the runelords, vile wizards whose sin magic enslaved entire tribes of giants and shackled them to building monuments to their glory. 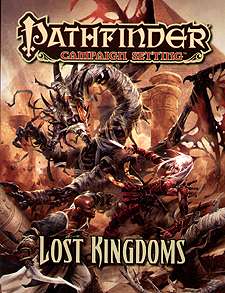 Lost Kingdoms is intended for use with the Pathfinder Roleplaying Game and the Pathfinder campaign setting, but can easily be used in any fantasy game setting.